The Cold War has just begun. The next several decades will be defined by an escalating race of espionage and technological one-upsmanship. You owe it to yourself to give your nation every advantage. That includes investigating the shadowy world of ESP and the transmission of messages from one brain to another. So the tests begin. On animals at first. A hypothesis is formed that two bonds would be universally easy to detect changes in: A) the natural relationship between mother and child B) the continuity of life itself. Logical, no? Comrades, this is the gilded pathway to hell as you blink to reality and find yourself on a Soviet submarine killing baby rabbits. Experiments like this when on through the 1970s with a particular focus on documenting if other animals could innately sense one of their own kicking the bucket. You’re in space. But not for long. The capsule you was unfit to leave Earth and you knew it before you left. Power failed and your orbit trajectory is about to send you screaming to your death. Atmospheric reentry will turn your body to goo before you hit the ground. With your last moments of radio communication you make sure that those with your blood on their hands know it. You curse the officials who sent you up in this death trap. You begin to weep in anger. Unsaid is why you went up knowing full well that you’d not come back alive: to protect a national hero who happens to be a drinking buddy. 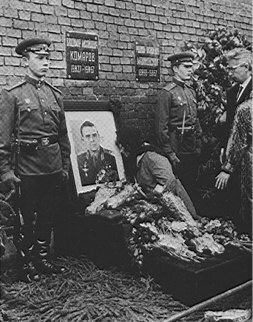 These were the last moments of Vladimir Komarov. His extraordinary story of bravery, friendship and barbaric bureaucracy behind the Iron Curtain are told in the book Starman. The mission was to stage a mid-space meeting between two Russian vessels where the crews would exchange one passenger each and come back to earth. It was to be a celebration of the 50th anniversary of the Communist revolution, a very important moment for current head of the Soviet Union Leonid Brezhnev. The problem was the Soyuz 1 capsule meant to carry Komarov was found to have 203 structural problems before it even left the ground. When it became clear that Brezhnev’s desire to see the mission take place would overrule any kind of safety concern, Komarov insisted on completing his mission because his back-up pilot was Yuri Gagarin, the first man in space and an icon of the Soviet space program. Not to mention a friend. So Komarov went up and his legend reverberates to this day. You are currently browsing the archives for the Soviet Union category.